← Restaurant review: Clos Maggiore – London’s most romantic, says Time Out! I’m up for a nice soup any day. But since soups take time and effort, who makes it when you can just buy it in plastic bags? Not this one though. 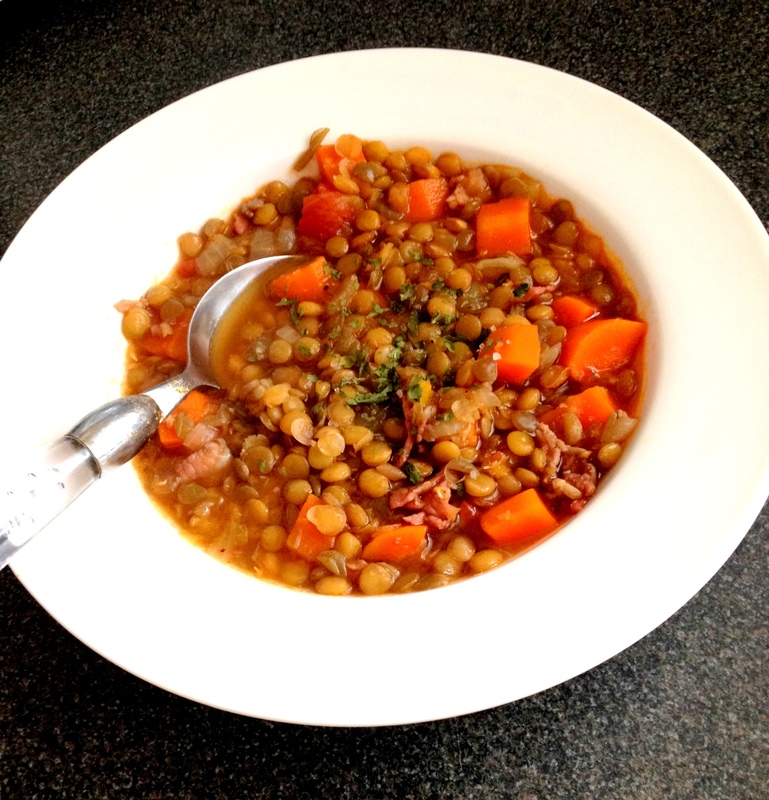 No Cuppa Soup can replace this delicious lentil soup that is, yes, officially a winter warmer, but what if I just want to stuff my face with lentils? Not to mention that it is so easy to make. 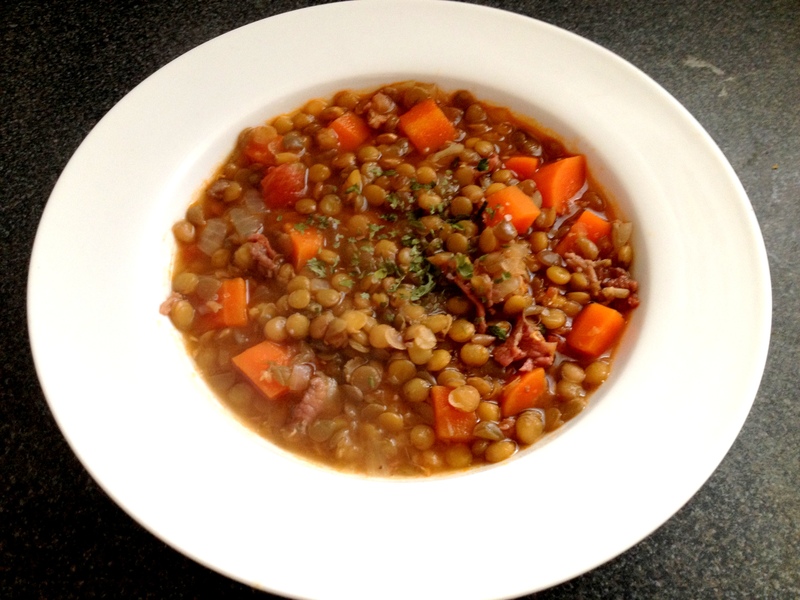 The inspiration came from Chef John over at FoodWishes.com, who just made this soup with black lentils. My little news agent didn’t have any black ones of course, but green ones are very tasty too. First of all, get everything ready – dice your vegetables (mirepoix) and slice your bacon into small chunks. Fry your bacon in a big saucer until it begins to crisp, then throw in, with a splash of vegetable oil, your carrots, celery, onions and seasoning, and sweat them for about 10 minutes, until everything is starting to cook. Now throw in your lentils as well and stir everything. After this comes the chicken stock, along with the two bay leaves, the garlic and the splash of chopped tomatoes. Mix everything up and bring to a boil – let it bubble for about 5 minutes, then turn it down and let it simmer for about 45 minutes, or until the lentils are done. Remember to top up with stock or simply water when the stew seems too dry. Basically, that’s it. What could be easier? Don’t you just want to dig into that thick, delicious stew? P.S. You know what would make this even better? Some cheese, under the grill until crisp. Now that would be a royal finish. Next time! Vera Sugár, graduate with a journalism and creative writing degree, started writing at the age of 10. Passionate about literature, arts, history and languages, she speaks fluent English, French and Spanish. Her works are available at http://goodaswinter.wordpress.com. This entry was posted in Blog, Main meals and tagged carrot, cheese, Chef John, cooking, dinner, easy, food, FoodWishes, French, ingredient, lentil, meal, quick, recipe, soup, stew. Bookmark the permalink.